With a mission to share the world of coffee, Atlas Coffee Club curates and procures sustainably farmed coffee from countries like Papua New Guinea, Burundi, Peru and Rwanda, zig-zagging across the equator. 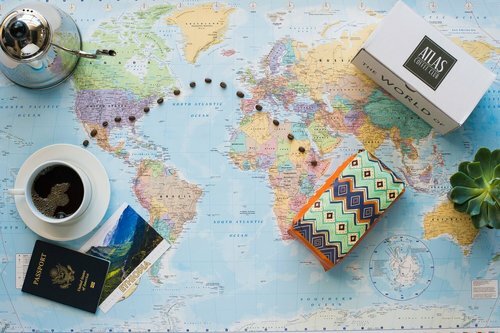 Operating as coffee tour guides, their monthly subscription invites coffee drinkers to turn their morning routine into a daily adventure, exploring coffee and culture from countries around the world. In addition to freshly roasted single-origin coffee, each shipment also includes a postcard, country information and a coffee bag designed by local textiles, highlighting the culture of that country. Each month’s shipment has it’s own unique story, like the coffee from Idjwi Island in the Congo, where the local coffee demand has provided dignified work opportunities for former rebels who now choose to lay down their guns and make money growing coffee instead. On average about 50% - 60% of the coffees they offer are either fair-trade certified, direct trade, or go through a coffee cooperative. All of the coffee sourced uses sustainable farming practices, essentially meaning they pay above market prices for their coffee to ensure the farms can produce high-quality coffee year over year, while also using farming techniques that protect the environment.